I recently rode my DRZ 400 from Las Vegas down to Los Cabos, Mexico. I went through Arizona and crossed into Mexico at Sonoyta, which was completely hassle-free. I then continued south through the state of Sonora to the city of Hermosillo where I spent the first night. This was not my first time in Hermosillo. I first stayed there during our 2007 motorcycle trip from Toronto to Buenos Aires. After Ted’s crash in the mountains west of the city, we spent about 4 days in Hermosillo so that Ted could convalesce in comfort before setting off for another 20,000 km of riding. I have a soft spot for Hermosillo because of the kindness and generosity that we encountered in this area on our previous trip, especially following Ted’s crash. On the current trip I courted danger by riding over an hour after dark (with a tinted visor no less) just to get to Hermosillo. I wanted a hot shower, a decent meal, and a comfortable bed – all of which I knew were available in abundance in Hermosillo but not necessarily in the villages to the north. When Ted heard of my night riding his response that I had not gained any wisdom as a Neurology resident. My response is that true wisdom is knowing when a menu is just a wish-list. That may be the most profound statement I’ve ever made on this blog. Also, it takes wisdom to to be able to take one look at a town and realize that no hot showers are in the offing. Just because I have endured tough conditions on past adventures does not mean I would not chose comfort if it were available. 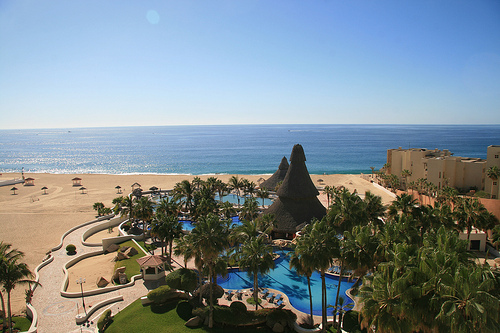 And Mexico is a land of comfort if you know where to look. The next day I set off for Los Mochis, where there is a Ferry to La Paz on the Baja Peninsula. After indulging in an exquisite seafood feast at El Farallon (“if you like seafood there’s no reason to eat anywhere else” according to the guidebook), I took the overnight Ferry to La Paz. Yes, I admit I paid extra for my own private cabin and slept soundly for the crossing. It was worth every penny. But I suppose a private cabin was not even necessary as the ferry was one of the nicest I had been on. I had been expecting the worst after some previous dubious crossings, such as from Aqaba, Jordan to Nuweiba, Egypt or from Aswan, Egypt to Wadi Halfa, Sudan. This was more civilized than even the crossings to Vancouver Island. As soon as I rode off the Ferry in Baja California I felt like I was in a different world. 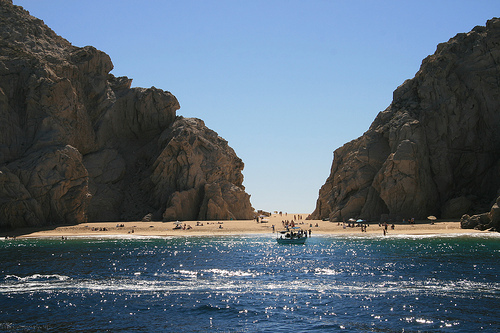 The rocky cliffs and desert landscape seemed so at odds with the crystal blue waters of the Sea of Cortez. 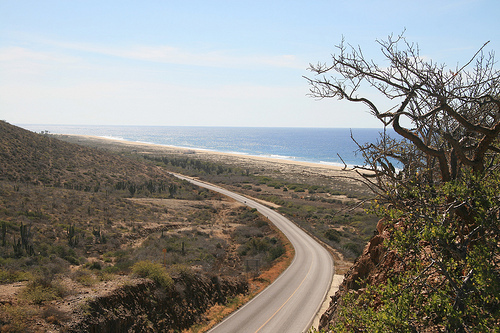 I was treated to some fantastic riding along the Pacific coast highway from Todos Santos to Cabo St. Lucas. Unfortunately I fear that this area is too beautiful for it’s own good. Scores of new resorts are being built and the fun little twisty two lane highway is being replaced by a twinned superhighway. Construction has already started from both ends. I hope that development doesn’t destroy the isolated beauty of the area known as the Marlin capital of the world. I left my motorcycle in the care of the Finisterra resort where I relaxed for 4 days at the end of my trip before flying back to Calgary. I look forward to the second stage of my trip which will take me the length of the Baja peninsula and up the west coast of California. My plan is to ride from Los Cabos to San Francisco in February. Finisterra resort, Cabo St. Lucas, Mexico. I would often see gray whales going by from the pool. On this trip I used Spot Satellite technology to track my progress using GPS coordinates. You can view my route on an interactive google map.